Transferring millions of bags a year, Heathrow Airport's baggage handling system is an intricate network of conveyor belts, and BAA intends to thread additional conveyors through the existing system to help alleviate strain due to the increased demand in capacity. Mace Group called in SES to devise a solution on how to survey the complex chain of conveyors in a manner that is safe and does not interrupt with the day to day operations at the airport. To achieve this SES implemented a laser scanning approach which surveys from known co-ordinated points at a safe distance. Using this method of surveying enables SES to put in to practice safe system of work procedures by keeping our surveyors at a distance from moving machinery. 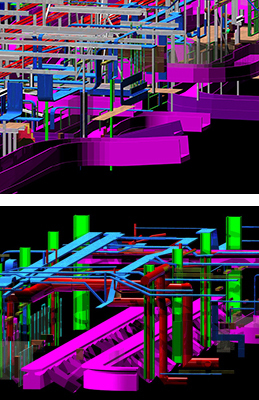 The additional benefits to laser scanning include the ability of our CAD department to produce 3D models of the exact environment, mapping locations of steelwork, pipes, ducts, cables trays, lighting and many more features. With the 3D CAD model the designers and installation team can highlight any potential clashes, identify fixing points and address access issues. With survey teams working both air and land side, SES continues to strive to deliver a service that is second to none for the aviation industry. 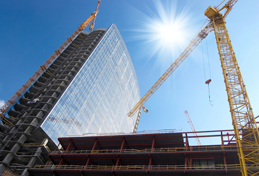 Site Engineering Surveys Ltd is committed to the highest standards of safety, health and environmental practice. We provide employees with suitable and adequate systems of work, procedures and guidance to support and assist them in conducting their activities in a safe manner supplemented by regular training. 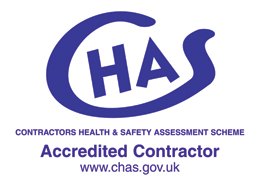 SES is CHAS approved and have been audited by our leading clients receiving approved accreditation for our Health & Safety. Our policy is under continued review as we look to maintain and promote a positive health and safety culture. 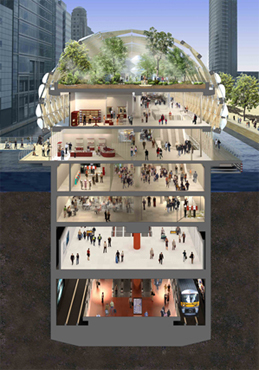 The structure which is now visible above ground will be the tallest building in Western Europe at 306m and will rise above London Bridge Station. 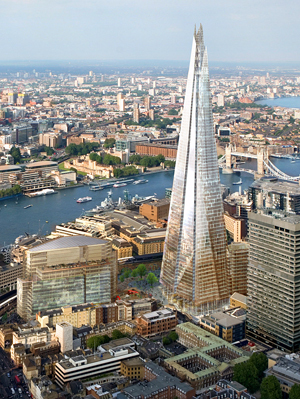 The Shard with its mix of offices, residences, hotel, restaurants and viewing platforms will herald a new era in high rise development for London and will become emblematic when all eyes look towards the cityin 2012. SES is committed to being at the forefront of technology and to use the most advanced equipment which is on offer to the modern day surveyor. We strongly believe that technology can help streamline the process of capturing survey information and it's for this reason that SES has recently required no less than 3no. 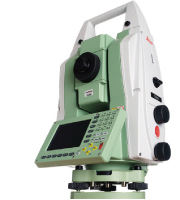 Leica TS30 total stations, the world's most precise, reliable, and quickest total station. Move, Lock, Measure, Transmit - unmatched speed to monitor points. Measurement data is then immediately available for on-board storage, or to be transmitted to any location via cable, radio, mobile phone or the internet. SES has made this investment to ensure that we deliver to our clients the most accurate and efficient survey service which is second to none. 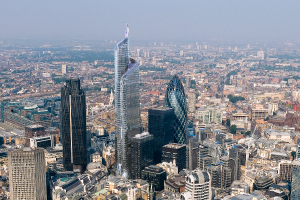 Consisting of 60 floors, 80,420 sq m of floor space and reaching 288 metres, the construction of the Pinnacle in the City of London is now well underway with the demoliltion of the existing basement slabs taking place. The piles have already been bored from the ground floor by installing pile casings from the ground floor slab through the original basement voids. SES have been appointed by Brookfield to establish a monitoring regime to identify any movements of the existing retaining walls and surrounding buildings. The depth of the new basement and the uncertainty of the construction of the existing retaining walls and with Victorian sewers and modern communication tunnels adjacent to the site perimeter it is essential that the smallest movements be reported. SES have positioned in excess of 60 tiltmeters in arrays around the existing retaining walls to monitor the walls for movement, by adopting tiltmeters SES are able to monitor the walls continuously, even whilst demolition is taking place directly above, giving real time results that are available to view by the structural engineers and other interested parties via a dedicated website. The Media City project at Salford Quays in Greater Manchester is well on the way and with building B4 out of the ground is set for completion at the end of 2010/2011. SES has won the Surveying & Setting Out package for the cladding system, the 13 storey building is a combination of stick work and unitised elements. The building has a 2 part splayed grid system from levels 00 to 05 which then steps in to form a rectangular structure between floors 05 to 13. 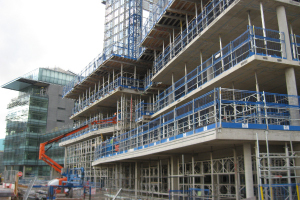 Cladding/Curtain Walling systems today require a high degree of accuracy, by adopting stringent surveying procedures and thorough checking SES can ensure the desired setting out accuracy is achieved. In addition to setting out, SES will provide full as-built drawings of the structure for our client which will keep our client informed of the dimensional accuracy of their work. We look forward to working on this Bovis Lend Lease site and contributing to a successful project. 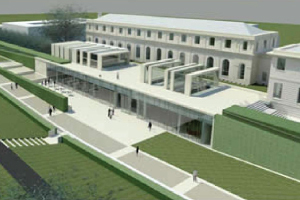 Construction of the new extension project at the National Maritime Museum, the new Sammy Ofer Wing has recently commenced. The Bovis Lend Lease project will include custom designed exhibition spaces, learning, research and archive facilities. The architectural concept is to create a scheme that subtly integrates the wing into its surroundings. Funded by an extraordinary £20 million gift from shipping magnate Mr Sammy Ofer KBE, the major new wing is scheduled to open in 2012. SES have been employed to carry out initial site verification surveys and establish the primary survey control, setting out gridlines and datums to each level of construction and as construction proceeds as built surveys of structural elements will follow . Serpentine Gallery is one of London's best-loved galleries for modern and contemporary art. It's Exhibition, Architecture, Education and Public Programmes attracts up to 800,000 visitors in any one year. 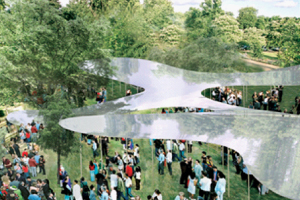 The Serpentine arts commission builds a new pavilion each year in Kensington Gardens and as a proud sponsor for the past 5 years SES looks forward to participating in the 2010 event. SES seized a great opportunity to give back to the community by having some fun at the Anthony Nolan Charity Dragon Boat Challenge. All funds raised went to help victims of leukaemia and thanks to the fundraising of the team we managed to raise over £1600. Not only did our team exceed their fundraising target , they also achieved a creditable 2nd place overall on the day. 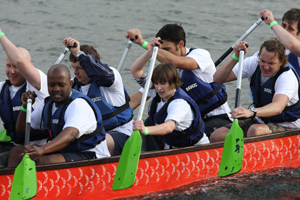 We raise our paddles and say a big thank you to all those who participated and donated to make this a successful Charity event. The area of Ravenscraig in Scotland's Central Belt will become home to over 10,000 people. and is expected to create 12,000 jobs and attract in excess of £1.2 billion of private sector investment over the next 15 to 20 years. 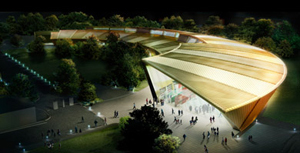 SES is involved with the setting out of the approx 2500 ton steel Sports Facility. The building boasts an indoor football pitch, sports hall, dance studios and much more. 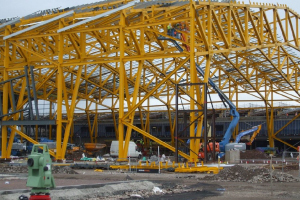 We currently line and level the steelwork fabricated by Bonesteel and produce as-built surveys for the hand-over to Balfour Beatty. With the trusses spanning 70m and at a depth of 5m they are indeed considerable lifts. SES intends to complete the setting out of the steel structure within the month. 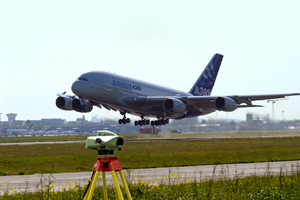 SES have recently achieved a staggering 16 years of providing continuous surveying support for the ongoing redevelopment of Heathrow Airport. Commencing in 1993 with a survey of the entire Terminal 1 building to providing survey control and as built surveys for the new Terminal 5 to recent works around the Central Terminal Area, SES project surveyors Jon Fox and Ted Yates have witnessed the transformation of Heathrow, overcoming all the security and operational difficulties experienced from working around the world's busiest airport. We have carried out building surveys of live baggage handling areas, to setting out stand areas for aircraft to monitoring the erection of the new Terminal 5 roof trusses to setting out piles with GPS to surveying handrails for new staircases - truly a one stop shop for all surveying requirements.